A Professor of Agricultural Engineering in the Department of Agricultural Engineering, College of Engineering (COLENG) of the University, Professor Emmanuel Ajisegiri, has called on researchers in Nigeria to embark on problem-focused researches, as a panacea to solving the myriads of challenges confronting the nation. Professor Ajisegiri disclosed this while speaking on his research contributions to the society, decried the existing gap between industries and the ivory towers and blamed the negative trend on the attitude of stakeholders to research in the country, saying, “I have worked as a research Professor for two years in Germany. I know what it means when you are a research Professor in a place. You also have your place in the industry; it is the problem in the industry that comes to the university to be solved. When it is solved, it is taken back into the industry”. In Germany, Professor Ajisegiri had worked on determining the optimum temperature, moisture and air velocity for maximum shelf-life. He also recorded research feat in 24 other food items including constituted fruits an d vegetable salads. “Let me tell you, it is unfortunate that people do not do meaningful research. They don’t do problem-focused, problem-related research and that is what is supposed to be the essence of research, to solve existing problems, and not just a mere academic exercise towards publications for promotion. There is no handshake between the industries, entrepreneurs and researchers”, he noted. Professor Ajisegiri, who is also a former South-West Coordinator, Academic Staff Union of Universities (ASUU), said the way forward is that research should be given its pride of place.”This is a knowledge-driven society, without the creation of knowledge, you cannot make it and it is through research that you can create knowledge and good attention should be given to it”, he added. Professor Ajisegiri, who had been a Professor of Food Engineering before he joined the University, recalled that it was the former President of the United States of America, John Kennedy that once said that, the level of development of any nation cannot be higher than the level of development of their education, as he opined that in other climes such as Europe, Asia and Latin America, there was positive correlation between the number of researchers and their levels of development, calling for attitudinal change to move the country forward. He further advised the government to fund research adequately, adding that if only one out of 100 research outputs was successful and could solve problems, it was capable of paying-off for the other 99 that did not succeed. The former Dean of COLENG, whose area of specialisation is food stability and sustain ability, said “everything a man does is dictated by the level of moisture (water) that is found inside of him. The way you think, the way you grow, the way you run or die. Everything is based by the level of water inside of you. People don’t know that the most amasing element in life is moisture because it dictates our behaviour, when you give birth, grow, die integrate or disintegrate and that sustainability was the essence of life. By ensuring reduction in food wastages and promoting food security, life and sustainability is promoted. Sustainability is central to food security and by extension, life security. Without food security, there cannot be development”, he stated. Some of the research breakthroughs of Professor Ajisegiri include processing of food, energy conservation and extraction of essential oil, saying he had worked on the extraction of essential oil, noting that people should be made to know that a litre of ginger oil can cost up to US$400. 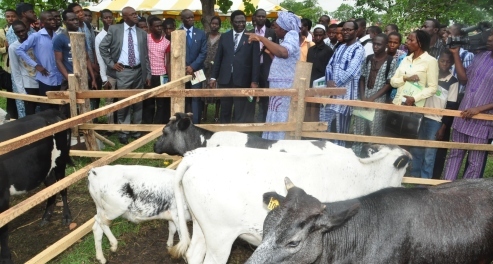 Other areas that he has recorded landmark results include mechanised planting of cassava using a metering device; tractor-to-power borehole drilling, using solar energy to power hatchery for chicks; and the combination of the traditional and modern methods to feed chickens through their cages. Others include milk pasteuriser, meat processing, maize, sorghum and millet stability, rice destoner, continuous oil press, brewery waste, cassava peeler, chipping and harvesting, fish kilns solar dryers. Professor Ajisegiri has also been active in the area of climate change and sustainability. Presently, he is the ACU/AAS Coordinator of CIRCLE (Climate Impact Research Capacity Leadership Enhancement), a programme, through which three post-doctoral fellowships have been awarded to academic staff of the University, saying the next area of research focus was on energy. “Many people don’t see that it is only about 25 to 30 per cent of the petrol or diesel that we burn in our vehicles that go into energy. I have something that can convert the exhaust gas into electrical energy. If even two percent can be saved, the two percent multiplied by the number of internal combustion engine that we have in the whole-wide-world, it runs into trillions of dollars every year, Professor Ajisegiri added.